I love my teas. I love brewing my teas with herbs and spices depending on what I need in this hour. We all know that herbs and spices have healing properties, we have spices and herbs for every season for every mood and almost for every little ailment that reminds us of our grandmothers. You know what I mean. This Calamondin (or Calamandarin, some people call it Kumquat) make a nice tea with either Earl grey or Assam tea or even with green tea if you have just started sneezing or have a nasal or tracheal congestion. 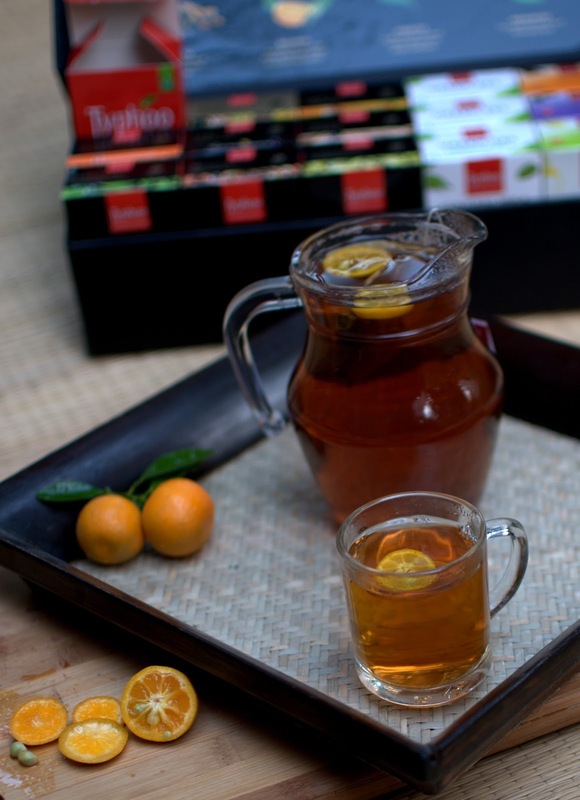 It's always better to have a soothing tea like this at the first sign of a cold attack. Calamondin or even Limes or Lemons have anti inflammatory properties coupled with a dose of Vit-C to sooth your throat. This Tea also helps if you have had a heavy meal which is not agreeing with your tummy. Simple things come to your rescue for a few day to day discomforts. Just steep a tea bag (Assam tea was used here) in hot water (500 ml for 3 cups, I need this much in one go :-)) for 2-3 minutes and put 3-4 slices of the citrus fruit you are using. This almost bitter zested Calamondin works best, so use it if you get it. Pour and enjoy the tea, sweeten it with a minimal amount of honey or sugar if you must. I would say the best teas taste best when there is no interference of sugar in it. Believe me. 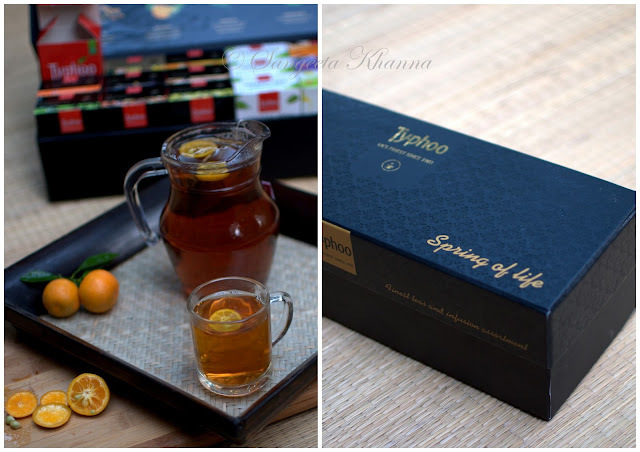 I was introduced to this tea brand called Typhoo at a recent event where celebrity Chef Vicky Ratnani held a live cook off to demonstrate how tea can be used in cooking also. 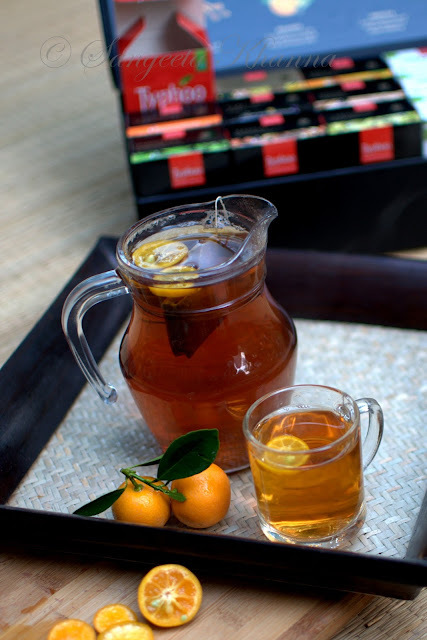 The goodness of tea can be infused into our everyday meals too if you are an absolute tea lover. And there are so many teas to choose from. Vicky poached a chicken breast (marinated with salt and pepper) with a masala tea bag and a few more spices like green cardamom, mace and a stick of cinnamon. The tannins in the tea coated the chicken well which was sliced beautifully later and was topped with ribbons of cucumber and a nice and tangy coleslaw of ginger and carrots. This Chicken dish was paired with Assam tea that felt like a perfect foil to a tangy, crunchy salad topped spice infused chicken. There was a base of mashed potatoes with curry patta and southern style spicing with this chicken and Assam tea went so well with it. Tea and food pairing is something that works bang on. Perfectly so. 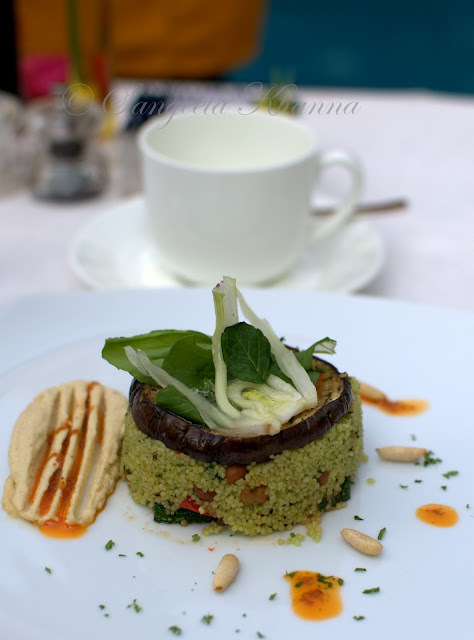 I also loved this herbed couscous and harissa spiced hummus with a very refreshing Moroccan mint tea. It was like a pairing made to seduce you. 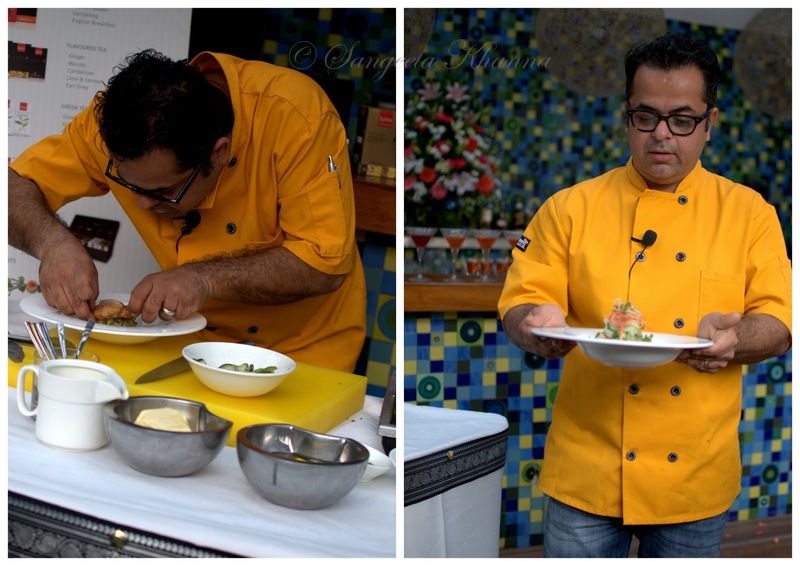 Now you know how the goodness of tea can be enjoyed with food too if you are not too fond of tea on it's own. I suggest you combine a few of your favorite fruits with hot or iced tea if you wish. They make for great all season drink to serve to your guests too. Please get rid of those packaged soft drinks and start serving some real drinks. Tea brewed with love is as real as it can get. These Calamondins were gifted to me by the lovely and passionate baker Deeba who calls them Kumquats for the love of how it sounds. I made a nice red chilly and calamondin marmalade with these lovely little fruits and a few more things apart form this tea. More on that later. It would be amazing if you grow a few herbs in your balcony or terrace garden. It's worth maintaining a few pots of herbs as they give you a lot in return. A green patch to look at, fragrant air and some exciting food and drinks to concoct for yourself. 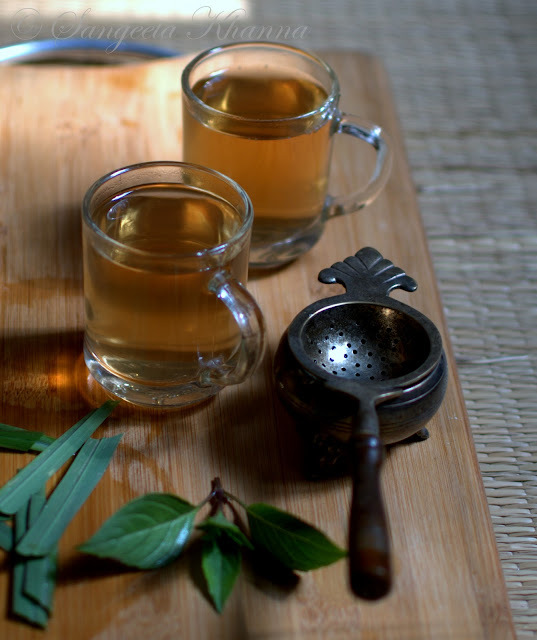 Here is one Lemongrass, Thai basil and Ginger infused tea for you. This is for those days when you have loads of work to be tackled and you are feeling lazy. Just spend five minutes in brewing this tea and get set to brave the work full swing. Pluck a spring of your Thai basil and 2 blades of Lemon grass, scissor cut them and throw them into a carafe or kettle along with a few slivers of fresh ginger root. Muddle them all together while the water heats up. 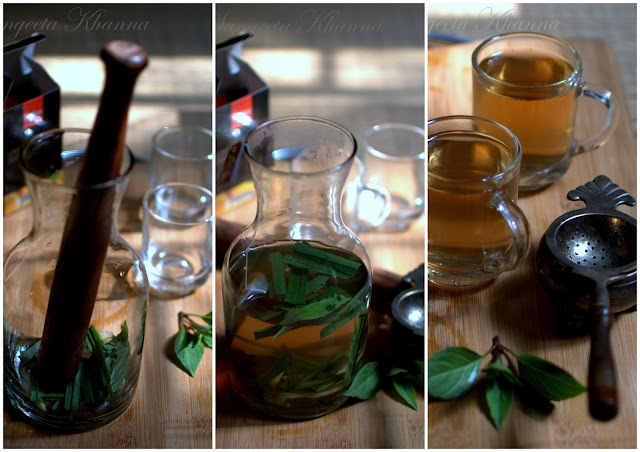 Pour boiling water over this mix of muddled herbs and suspend a tea bag (Lime and lemon from Typhoo) into the carafe. 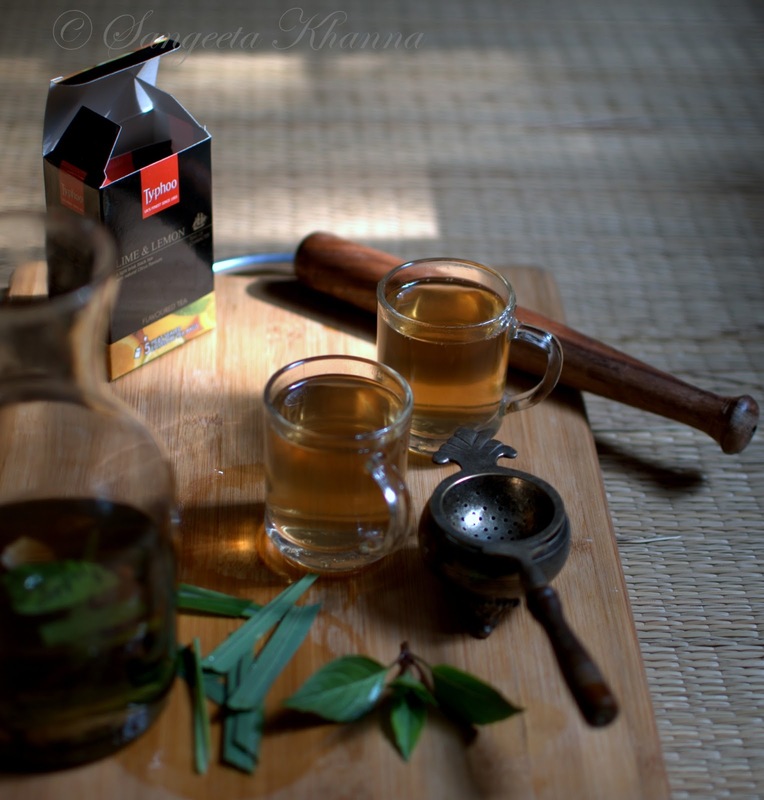 Add a slice of Lime if using Assam tea, steep for a couple of minutes and pour the freshness for yourself. This is the tea to start a day or to start head on with a truckload of work. My savior I tell you. I quite liked the quality of teas by Typhoo. The herby ones are great but the fruit blackberry one I felt was insipid. I would like to add a few slices of real fresh fruit to my teas as I mentioned above. Dried fruits would work only when the fruit used is best quality and has been dried in ideal conditions. Somehow no fruity tea enclosed in a teabag has yet lured me. I would like a spiced or plain tea to start with and add on my fresh ingredients to it. I would also like to use some of these spices and herbed teas to infuse a few desserts of mine and may be to infuse a plain boiled rice with a herb tea. Stay tuned to see a few more simple food turned exotic kind of recipes here...food should please all the senses I believe. 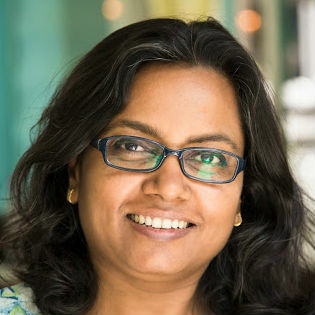 I would try iced tea with the blackberry one Sushmita. the grey and cold winter here in London make you reach for the kettle for a hot cup of chai through out the day ... and what better way than to make them tastier and healthier :) ..beleive me your post made me rush and get some freshly grated ginger with tea grown in my home land :D (i am from Assam).. Awe Amrita..I have a few friends from Assam and I know how they keep being nostalgic about the tea grown there. Enjoy your homegrown tea my friend.And thank you for your sweet words. It is Ruchira. Try sometime, I'll bring you some Thai basil and lemon grass next time. Beautiful! I love how much you did with ty.phoo! So much promise. I love the calamondis/kumquats...and the muddling too. Nice! Also like the sun streaming into your pictures. Ah, everything looks so beautiful. I don't like putting anything - no sugar or milk even - in my tea. Its a family oddity, my dad's family always drinks plain tea instead of masala chai. But your infused teas look gorgeous!